Cadwell park is a wonderful circuit but it has its own micro climate which usually includes a big cloud that sits right over it and every now and then drops a load of water. Someone, somewhere had seconded said cloud to an alternative purpose this weekend and we had wall to wall sunshine. The first time I have ever been here and it hasn't rained. To be fair though this is only the third time I have been here in 6 years. Qualifying was, as usual, my first time out on the bike since our last race four weeks ago. I should of walked the circuit before as I was looking for previous markers that either weren't there or I just couldn't see. I stayed out for the full 15 mins and managed my fastest lap on the final lap. My PB from April was a 1:48.490, I qualified with a time of 1:48.001, placing me in 12th on the grid of 31. Race 1 started with a near perfect start, I managed to hang onto the front guys for a few laps before their higher top speeds and the long straights meant I lost touch. I had by this point dropped those behind and found myself circulating on my own just working on my gears and time. I set a new PB of 1:47.534 and finished in 12th. My time placed me in 13th for race 2. Race 2 was the race that didn't look like it would be run on Saturday due to lost time from stoppages. I got a great start and was in 10th through the entire race. I dropped off the front runners after a few laps but due to a disqualification I was promoted up to 9th after the race. My PB was now 1:46.107 and I was placed in 10th for the start of the third race. Race 3 started OK but my clutch was beginning to tell me it wasn't happy with race starts any more. Due to some shenanigans on the start I went though the first corner in 7th place only dropping to 8th by the end of lap 1. Cadwell was a much more familiar place now having located my turn in points, braking markers and identifying correct gears for corners. I finished the race in 10th again with a new PB of 1:45.648. My grid position for race 4 was 10th. Race 4. The grid was a little thin as it was one from the last race of the day and a few people had given it a miss to pack up. My clutch was unhappy again off the start, I think I need to replace it, and I got a false neutral as I selected second which lost me a place I had made up off the start. I lost a couple more places and ended the race in 12th with another new PB of 1:45.627. A thoroughly entertaining weekend of racing with glorious weather. 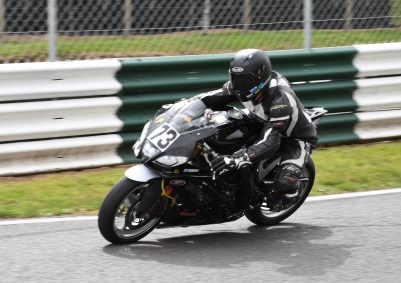 Every race saw a new PB and the bike finished every race without incident. I've finally got my reliable SV back. Next stop is Pembrey, Wales next month for the final round of 2018.